Does Re-Releasing Oscar Nominees in Cinemas Work? The nominations for the 86th Academy Awards (Oscars, to you and me) have been announced, insta-shared, tweeted, analysed, commented and blogged. The front runners that were all released in the fall will not be out on DVD or Blu-ray for at least a month: Gravity (25 February), 12 Years a Slave (4 March) and American Hustle (18 March), incidentally the same day as Disney’s Frozen. So will it drive people who have not seen them yet to want to catch them on the big screen? For the purpose of this article we will primarily look at North America, as many Oscar contenders such as 12 Years A Slave or Wolf of Wall Street have only just opened overseas. American Hustle, which has taken over $100m in the US (and Canada) domestic market, is currently doing best with its number two position in the charts behind Lone Survivor and ahead of Frozen. 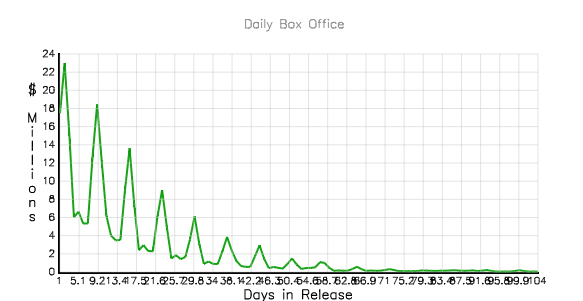 But the film has been going steadily down, as witnessed by this chart from BoxOfficeMojo.com With over 2,600 screens still playing it, there is thus no need to “re-release” the film as it has not gone out of circulation. 12 Years a Slave, which has done extraordinarily well given its tough subject matter, taking in over $39m in the US box office, is currently 22nd in the charts. 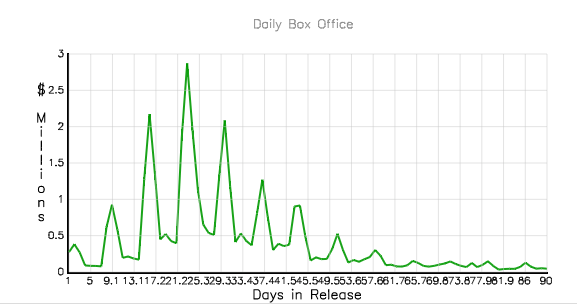 The film had a classic and steady week-by-week growth in the number of screens showing it: 19 – 123 – 410 – 1,144 – 1,411 – 1,474 (peak) – 1,165 – 1,082 – 497 – 301 – 154 – 151 – 114 and would seem to have largely run its course, as witnessed by the daily chart (same source again). Gravity is more interesting, sitting three slots below 12 Years in 25th position. It has been out longer than the two above films and largely disappeared from circulation, though at 155 screens it is still ahead of 12 Years a Slave. Gravity displays what is typical for modern blockbusters in terms of spectacular opening ($256m in US to date) and then trailing off, though with more longevity (counted in weeks, not months) than others. It too seems to have largely run its course. How do you plan to spend Martin Luther King Jr. Day this year? Fox Searchlight has a suggestion: Go see 12 Years a Slave, which the studio will re-release into 700 theaters nationwide on Friday. To mark the occasion, the studio made a recut 12 Years promo that combines footage of the film and audio from King’s “I Have a Dream” speech, delivered from the steps of the Lincoln Memorial during 1963?s March on Washington. This is a fairly substantial re-release, though the film is seen as the one to beat for Best Picture. Whether it pays off we will know next week. Last year Warner Bros did a push for Best Picture winner Argo, as did Fox for Life of Pi, though these were often centred on overseas territories such as Singapore and India after the films had actually won the coveted statuette. With many of the worthier Oscar winning films having trouble scoring good box office numbers in emerging markets, due to lack of stars and obscure or esoteric subject matters, it is here where the ‘Oscar bounce’ is counted on. However, the ‘Oscar bounce’ does have a proven effect for nominees in the US. 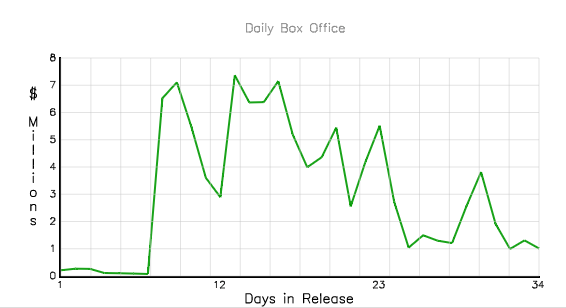 As witnessed from the BoxOfficeMojo.com chart, Argo recovered from a low of just over 300 screens in the first week of Janaury when it earned just $1m, after having been on release for three months, to over 1,400 screens in the second week of February when it took close to $3.5m and re-entered the Top 10. Interestingly the 2013 nominations were announced 10 January, so Argo built a solid-rerelease climb in the month following and run-up to the Oscars. It will be telling to see how much this will be the case for the this year’s three front runners.